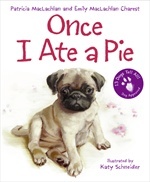 Once I Ate a Pie, by Patricia MacLachlan and Emily MacLachlan Charest; illustrated by Katy Schneider. Harper Collins, New York, 2006. Dog lovers young and old will delight in these expressive canines that Schneider’s paintings so expertly depict. There’s Mr. Beefy, the bulldog, who, when he steals people food, likes to eat in private and did, indeed, once eat a pie. There’s Gus, the German Shepherd who wants his people in a group. “Like sheep,” he says. Then there’s Lucy, the shelter dog, who sleeps between her two owners. When I saw this book on the shelf, I knew I had to buy it—for my adult daughter who owns two dogs. It is indeed a book for all ages of dog lovers, but beware, the youngest child will undoubtedly want a puppy after experiencing the delightful canines in this book.